Create a focal point in your living space that is both stylish and purposeful with this television wall unit from the Mercantile collection. 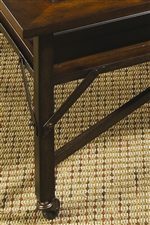 Finished in a warm Whiskey color, this casually styled piece offers clean lines with straight square legs and a splash of character found in the accent metal hardware. A wide variety of open and closed storage spaces provide the piece with organization opportunities and a place to showcase your favorite decorative accessories. 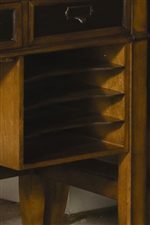 This wall unit features two glass-front doors with one adjustable shelf behind each, six drawers - the top drawer on the center console includes a drop-front for use with media components, and three open compartments where DVD players, DVRs, and any other electronic accessories can be stored. 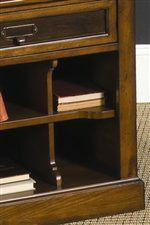 Four open adjustable shelves - two on each flanking pier - provide the perfect place to display family photos and other items of your choosing. Encourage relaxation in your home with the fashion and function this entertainment wall unit from the Mercantile collection has to offer. The Mercantile Six-Drawer Two-Door Entertainment Wall Unit with Shelving Storage & Display Space by Hammary at Jordan's Home Furnishings in the New Minas, Halifax, and Canning, Nova Scotia area. Product availability may vary. Contact us for the most current availability on this product.